Southerners see the Arctic as an exotic land of magnificent scenery and strange phenomena: endless summer sunlight, and winter darkness that lasts for months on end, when even the ocean freezes and the country is lit by the flickering light of the aurora borealis. To peoples who come from temperate countries of forests and plains, the Arctic appears to be an empty land of rock, gravel and ice, where nothing grows and life would seem to be impossible. But to hunting peoples who have developed the skills and knowledge necessary to survive in the Far North, the Arctic environment provides a productive homeland. Its wealth is in its animals. 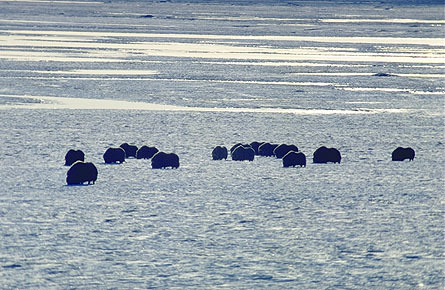 Large numbers of caribou, musk oxen, seals and walrus gather in dense seasonal concentrations, which make them easy to find and hunt. 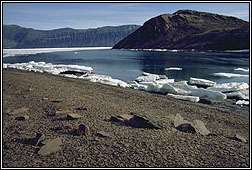 Migratory birds flock northwards to the summer tundra, taking advantage of the lack of predators and the food supplies stimulated by 24 hours of sunlight. Rivers and lakes teem with char, trout and whitefish. 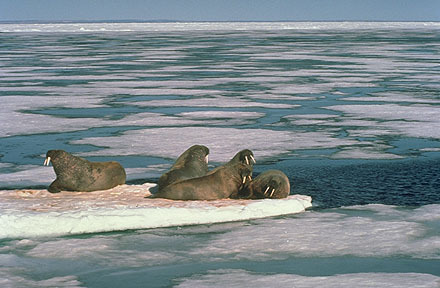 The Arctic was the last large region of the habitable world to be occupied by humans. The ancestors of American Indians passed through the Western Arctic near the end of the last ice age, as they expanded from Asia to America. However, their descendants never developed ways of life that allowed them to live throughout the year far to the north of the forests. Hunting peoples of northeastern Siberia seem to have been the first to master the Arctic environment. About 5,000 years ago, some of these peoples crossed Bering Strait from Siberia to what is now Alaska. 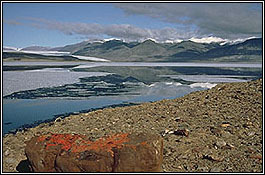 The crossing was probably made on winter ice, which forms a dangerous and unstable bridge between Asia and America. Over a period of several generations, they expanded across Arctic North America and became the first to explore this huge region of the northern world. By 4,000 years ago, their descendants had spread out to occupy all of Arctic North America, as far north as Greenland and as far south as Labrador. Archaeologists call these peoples Palaeo-Eskimos, a name that means "Old Eskimos." In Inuit traditions, they are known as "Tunit." For over 3,000 years, in isolation from the rest of the world, they developed a unique and intriguing way of life.